Welcome to Dr. Saturday's College Football Madness. Ever wondered how the 2013 college football season could have turned out with a 68-team playoff? You've come to the right spot. While 68 teams participate in the NCAA tournament, we're running an expanded college football playoff. And you're in charge. Each matchup is open to a vote and the team with the most votes in each game moves on to the next round. We've got two underdogs with the voting power. The two games with the most votes also happened to be our two upsets in Regions 1 and 3. Coincidence? We think not. Oregon and Clemson fans, you need to be on your game to ensure you'll move on to the next round. Utah State became Norfolk State and upset Missouri, while No. 15 seed in Region 3 North Carolina upset Arizona. We appreciate the passion of the two fanbases and are very intrigued to see if it continues. That said, there's no way in heck either team would have a chance of making it to the Elite Eight in a real-life 68-team College Football Playoff. They just weren't that good. Voting for Regions 1 and 3 is open through 11:59 P.M. ET Sunday, March 29. Click here for the original bracket. We think UCLA would have taken a Mettenberger-less LSU squad, but the SEC prevailed. Will it prevail again? Oregon vs. Florida State isn't a bad Elite Eight matchup, eh? But this is a suddenly mighty Utah State voting bloc. 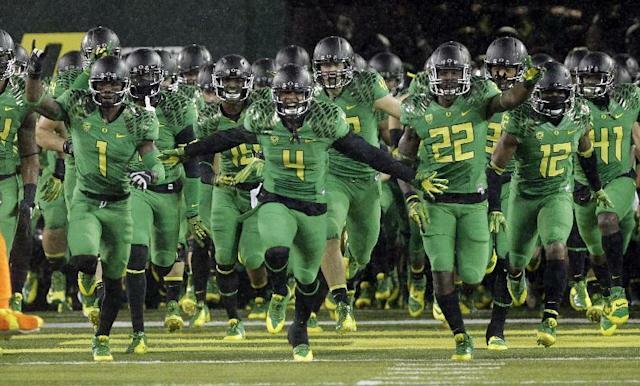 Mobilize, Oregon fans. The Crimson Tide easily dispatched of Texas Tech and move on to another Big 12 team. WIll it be as easy? This ACC matchup did not happen in 2013, so it's not a rematch.